This article at the Daily Mail describes a small heater based on tealights and flowerpots. I'll try my shot at giving a good referenced answer. As evidenced in this clearer explanation of the claim, by efficiency it is meant that the heat of the candles is retained by the pots and released slowly. There is also a secondary claim that this makes the system efficient enough to heat an open space. There is no claim that the total energy output is increased. Is the heat retained longer? This is simply due to the specific heat capacity of the materials, air (1005 J/kg°K) being worse than clay (1381 J/kg°K), being worse than mineral oil (1670 J/kg°K). Is the heating power enough? Heating power is measured in BTU [which is a few percent larger than 1 kJ], while the exact details of how many BTU are required per room depend on the size, insulation of it and the efficiency and positioning of the heating unit, there are standard calculations and examples which are used to size heating unit in houses. For example, in the source above typical characteristics of a heater are given between 10 and 40 kBTU/h (about 3-11 kilowatts). In my experience, often a 2kW (6800 BTU/h) heater is also enough, so I'll use that as a lower limit. Which can be converted to be 263 BTU/h. Therefore, by division, a 6.8kBTU room heater corresponds to 26 candles. It is easy to see that the heat released by 4 candles, as in the claim, is 6.5 times smaller than an electric heater and thus vastly insufficient to heat a room. Such a home made heater is also unsafe. I am adding this even if a bit off topic to make sure that any future visitor gets a warning. From the first source. Electric space heaters are generally more expensive to operate than combustion space heaters, but they are the only unvented space heaters that are safe to operate inside your home. So, what you have is an inner core of a flower pot which gets very hot and then you have this one [pointing at the outer pot] which doesn't get massively hot but it does get warm. But what you get is a convection up here [pointing at the bottom of the pot] and out the top and it really, really flows out well. Stand the candle in a 6-inch flower-pot so that the hole is not covered; put a second flower-pot over the top. The top pot soon warms up, giving off a lot of heat. Raise the lower pot off the ground. Also, it is important to note that tea lights are named such because one of their purposes is to warm tea or in food warmers and products are sold with this in mind. which works out to about 262.7 BTU/h or 1050.9 BTU/h for the four of them. At this point it is important to draw attention to the fact that the maker of this claim is using it while running a computer in his room. Desktop computer put out heat that can affect the room temperature. If we use a conservative value of 145 watts of heat or 494.8 BTU/h based upon the conversion which is also contributing the room temperature. According to a BTU calculator, 341 BTU (99 watts) are needed to raise the temperature of a 2x4x3 meter room (very rough estimate based upon the apparent queen size bed and desk present in the video) with normal insulation 1°C. This means that under ideal circumstances, that it may be possible for the candles to raise the temperature of the room 3°C with the computer possible contributing another 1°C of heat. As such, in a small room room it is plausible that a small, colder winter room (i.e. under 20°C) the combined 4°C increase in temperature might be sufficient. However, such an effect would be highly dependent upon the size of the room, location of the heater, drafts, and personal preference in room temperatures. Yes, it is more efficient than just tealights, though still a very small source of heat. The internal air temperature for radiant heated buildings may be lower than for a conventionally heated building to achieve the same level of body comfort, when adjusted so the perceived temperature is actually the same. 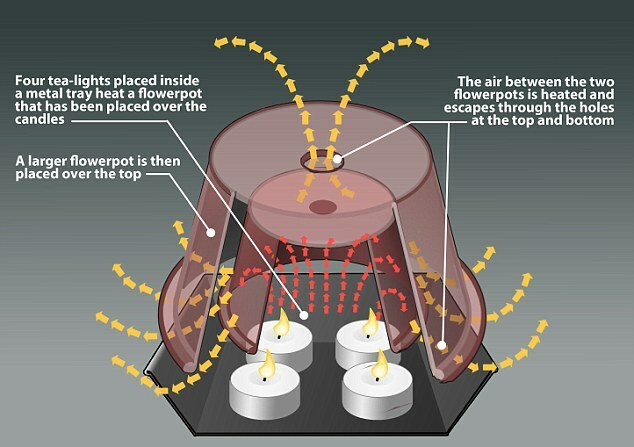 This system appears to be a more effective way to heat than an open candle flame, because the flame heats the clay pot, which radiates the heat to the room. The total heat input is still very small, however, as noted below. At best, an open fireplace is no more than 20 percent efficient. Efficiencies can actually be much lower, and even negative if large amounts of room air are drawn out through the chimney. The radiative fraction was determined by finding the ratio of the radiative emission and m x Hc [my note: this is the total heat produced by combustion], which yielded a value of 0.17 +/- 0.01. Thus, 17% of the heat produced by an open candle flame is radiated to the surroundings, with the remaining 83% carried away by convection. 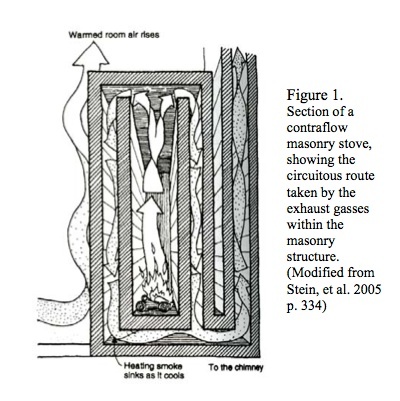 This convective loss is equivalent to the convective loss up the chimney for an open fireplace, as it rises rapidly to the ceiling where it is effectively lost. Thus, the tealight and flower pot function as a small-scale masonry fireplace, reducing the convective losses and increasing radiation to the room, as opposed to an open candle which functions like an open fireplace, with most of the heat lost by convection up the chimney. Tea lights are made of paraffin wax, and are commonly about 38 mm in diameter and 16 mm high, and burn for 3 to 5 hours (per Wikipedia). Paraffin wax has a density of about 900 kg/m3, and a heat of combustion of about 46 MJ/kg. running through the math, we get 0.75 MJ/candle, and assuming a 4 hour burn time and 100% combustion efficiency (which is close, though not exact) that is a power output of 187,500 J/hr, or 52 watts. If 4 candles are burning at one time, this is 208 watts - probably quite close to the heat being generated by the two computers and two desk lamps in the room shown in the video. Would it be better to put a light bulb inside a flower pot? Probably, since it wouldn't produce any combustion by-products such as carbon monoxide, which flames inevitably do. But from a purely economic point of view, it may actually be cheaper to use the candles, if the pricing claim is true. If the candles truly cost 1 £ for 100, then the heat costs about 5 pence per kW-hr, which is lower than the 14 pence I found by looking at British electric rates. However, the cheapest source I found for these candles in the US is $6 per 100 (3.75£/100). At this price, the candle heat costs about 18 pence per kW-hr, which is more than electricity. How much will 4 candles heat a room? It depends, but probably not much. According to Wikipedia, candles give off heat at a rate of approximately 80 W. The source cited by Wikipedia actually lists 77 W +/- 9 W on page 277. 2.464 kWh = 8,870 kJ. Which gives a heating amount of approximately 491 °C if you assume there is no loss of heat from the system. Of course, this is an unreasonable assumption. We can maintain a temperature difference of 12 °C between inside and the outside using the 308 W given off by the four candles combined. Adding in a 2m2 glass window to the room using the heat conductivity value from Wikipedia changes the result drastically. With that window allowing heat to escape, the four candles can only maintain a 1 °C difference between inside and outside. Even if we assume that the air is still and only half the room heats up, that's only 2 °C. It's complicated, but unless you have a very well insulated room, four candles are barely going to make a difference. I'll also have a go at answering the unspoken question "Are tea lights cheaper than conventional heating?" for interest's sake. The video states that the tea lights last 4 hours so the total for the day comes to 8 candles at a cost of 8p. The same amount of heating using an electric heater (assuming 100% efficiency) would cost approximately 33p. The same amount of heating using a gas heater (assuming 100% efficiency) would cost approximately 10p. The tea lights are cheaper but not by much. And only if you ride or walk to Ikea. Assuming that cheap candles produce the lower rate of heat (68W) the total heat given off by the 8 tea lights over the day would be 2.176 kWh. The cost of this much gas is approximately 9p which is still more expensive than the 8p worth of tea lights. Adding in a value based on Mark's calculation that a tea light gives off 52 W, the equivalent amount of gas would cost 7p. Tea lights are currently £1.75 / 100 pack on Ikea's website which changes the heating cost from 8p per day to 14p per day. Tea lights would be more convenient on a boat or in an attic which may not be supplied with gas and electricity. the main physical effect I can see of the flower pot is increased heating power due to faster rate of burning. But burning candles (or any other fuel) indoors without a proper exhaust/chimney to take care of the exhaust gas is not a bright idea! And four candles burned over 8 h is about an order of magnitude below civil engineering recommendations for installed heating power. newer ones: 14 g each - I'll use these for calculations. The heat of combustion for paraffin is about 46.00 MJ/kg higher and 41.50 MJ/kg lower heating value, respectively Thus, each of the 14 g candles can give ca. 650 kJ, or approximately 2.5 MJ in 4 tea candles (HHV). For the LHV, we get 580 kJ / candle and 2.3 MJ for 4 candles. The higher heating value HHV is calculated assuming that all hydrogen in the wax will at the end become liquid water, the lower heating value LHV leaves the water as vapor. Heating a room in winter, you'll probably get the HHV, but that means that the room will get damp (unless you air it, and then you loose your precious heat through the air exchange). Already without flower pots, a candle with properly trimmed wick will not soot, so we can assume losses due to incomplete combustion to be negligible. Radiation losses are negligible as well - particularly if you close the curtains because you are in a precarious heating situation. We can thus say that the candle already without flower pot is a 100% energy efficient heater. Thus, the flower pot cannot enhance the energy efficiency of burning the candles. Physico-chemically, if the flower pot construction works like a chimney, and possibly even like a chimney that preheats the air, then the candle can burn faster (higher power). Of course, it will burn out accordingly faster. I don't think that the flower pot helps much against the convection. However, I don't have measurements to support this. But, if that would be the desired effect, the stove should be placed on the floor just under the window, where the upward convection from the stove works against the cold downward convection from the window, (or maybe a bit further up in front of the window, so we can get the benefit of the radiation heating). This would be the claim about the judicial positioning helps, which is true (I remember that we learned these heater positioning concepts with the usual convection heaters in elementary school). Physiologically and probably also psychologically, one important difference between convector heating and heating by a stove is that with the stove more of the heat transfer occurs by radiation instead of by conduction and convection (via the air). Therefore, the heat perception can be vastly different even though the air temperature did not change that much. The perception of a human being of heat, cold or thermal comfort does not react on the air temperature only. In an often comparable order, solar radiation, wind velocity, humidity as well as heat radiation of atmosphere and ground (Landsberg 1972, VDI 1998) have a decisive influence. 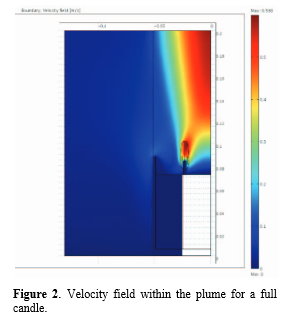 So in order to get a comfortable amount of heating, with direct radiation we may be able to heat only when we are in the room and need the heat and possibly deliver it better where we need it (as opposed to heat all the air and the walls, with the corresponding increased heat losses). However, I do not see why a flower pot would help with the radiation part (over open candles). The more consequent implementation of this idea to deliver the heat where we need it are pocket stoves. Taking the 15 m² from @Ladadadada's answer, they would argue that 600 - 900 W heating power is needed. That would be burning ca. 3 1/3 - 5 candles per hour. However, this calculation does not take into account that if you burn the candles at that rate, you need to start thinking about exhaust gas in your room air: 5 candles are 70 g and need about 150 l of oxygen to burn (and will produce about 100 l CO_2 and another 100 l of water vapor (or 26 ml of liquid water)). This paper about indoor air quality (Gesundheitliche Bewertung von Kohlendioxid in der Innenraumluft, Bundesgesundheitsbl - Gesundheitsforsch - Gesundheitsschutz, 2008, 51:1358–1369, DOI 10.1007/s00103-008-0707-2) by the German Umweltbundesamt cites the outdoor air concentration of CO2 usually around 400 ppm, while indoors averages of between 800 and 3000 ppm were found. 1400 ppm is considered the limit for bad indoor air quality (good indoor air quality is with < 800 ppm). Thus, we can produce 1000 ppm (1 l / m³) until the bad air limit is reached. With our estimated total room volume of 37.5 m³ that would be reached after 22,5 min. We'd need to air the room completely almost 3 times per hour - that would completely cancel out our heating efforts! Of course, if we could cut still cut this down to airing the room only every hour or so - but we'd already be in an atmosphere were studies (see the paper above) found school children to perform worse on cognitive tasks. So yes, it is really not a bright idea to try heating a room by combustion without having the fumes led out by a proper exhaust! @Mark estimates that each tea candle (at a burning rate so that it lasts 4 h) produces about 50W heat. This is in the same order of magnitude or somewhat lower as a human doing office work. In other words, instead of burning 4 tea candles over 4 h, you could also ask 2 or 3 buddies to join you - they'd have the same heating effect. I calculated this example because it probably allows us to have a better intuitive perception of how much heating we can (or rather: cannot) expect from the candles. Are ion heaters significantly more efficient then normal electric heaters? More stars than grains of sand? Does painting your radiators black make your heating more efficient?